Hollywood needs better quality than a GoPro can deliver for aerial footage, but heavy cinema cameras demand really expensive drones to lift them. Blackmagic Design clearly thought all this through and is about to launch a Micro Cinema Camera with a Micro Four Thirds mount (update: The product page is now live). It should suit high-end producers' needs with a Super 16 sensor (30 percent smaller than a Micro Four Thirds (MFT) sensor) and RAW video with 13 stops of dynamic range. It also has built-in drone radio control inputs (PWM and S-Bus), a giant nod to its intended usage. The 13 stops of dynamic range and Super 16mm sized sensor match the company's Pocket Cinema Camera (BMPCC). Unusually, the Micro Cinema Camera has both global and rolling shutter modes, which will eliminate the "jello" effect when the camera moves a lot. It weighs in at 300 grams (10.65 ounces), making it a bit lighter than the BMPCC. 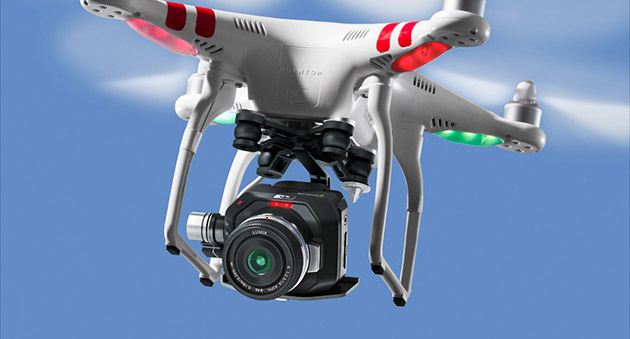 Marketing imagery shows it being hoisted by a $700 DJI Phantom 2 (below), but you'll likely need a featherweight lens like the 20mm f/1.7 Panasonic "pancake" model. Like a GoPro, it should also be an ideal helmet, vehicle or "crash" camera. It'll produce 1080/60p 12-bit RAW or ProRes video with a rolling shutter, or up to 1080/30p in global shutter mode. Other specs include SDXC and SDHC card recording; remote control for iris, focus and zoom (on active MFT lenses); a full-sized HDMI port for monitoring; Canon LP-E6 battery support; a 3.5mm audio input port; and an expansion port. Unlike previous models, there are external buttons to adjust the camera rather than just touchscreen controls. And the price? It's the same as the BMPCC at $995, making it a more-than-reasonable option for most filmmakers. Given that and the fact that it can be mounted on the ultra-popular DJI Phantom 2, expect to see a lot better drone footage when it arrives in July. Update: The product page is now live, so we've updated the post with more information.